With the announcement of the @mercurybayseafoodfestival happening in September PLUS an exciting new collaboration with @thelostspring and @glassbottomboatwhitianga, we have a chance for you to win a weekend away! 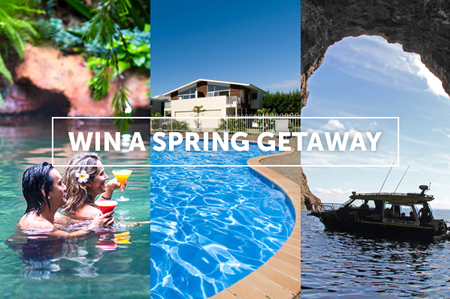 To Enter simply ‘LIKE’ both Beachside Resort Whitianga and The Lost Spring facebook pages and comment / tag the person you would love to bring with you on the competition post. Prize will be drawn 7 September 2018. Prize must be claimed within seven days of announcement, winner will be announced in a comment on the competition post. Prize must be redeemed 21 - 22 September 2018. Bookings essential. Check-in time is 2.00pm. Late checkout is 12 noon. Accommodation is for two adults, but you can bring the kids too for a small fee (Please note The Lost Springs Child Policy before you make the trip). Please be aware Glass bottom boat services are subject to weather conditions so will be at the discretion of the operators on the days of the stay. If the prize winner is unable to attend the dates the prize may be redrawn if a suitable collection of the prize cannot be reached in which case subject to availability will apply, excludes public holidays. Travel to and from the hotel is not included in the prize. Valid for New Zealand residents only.